The story behind the name: The ancient fish constellation, Piscis Austrinus or Piscis Australe, is one of the original 48 constellations noted by Ptolemy. This constellation, referred to as Piscis Notius before the 20th century, was believed by the ancients to be a fish laying on its back "drinking the starry water from Aquarius's urn". Scholars think that the constellation is associated with several ancient cultures. Among those were the Assyrians for whom Piscis Austrinus may have been represented as the fish god Dagon. The Egyptians may have believed these stars to be Oannes, the god of waves and source of knowledge. The Arabs referred to the constellation as Al Hut al Janubiyy, meaning "the large Southern Fish". The best known star of the constellation is located at the fish's mouth. 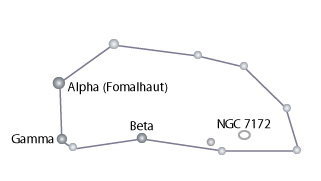 This star, known as Fomalhaut, is the 17th brightest star in the entire sky. The star lies at a distance of about 23 light years from Earth, which is relatively close for the stars we see in the night sky.